Atou, 25, is of Sarake descent. She is paraplegic and wheelchair bound. Her disability happened as a result of an injection she received as a child. (There is speculation that drugs were being tested on her.) She grew up with her maternal grandmother and 10 cousins. Her father died shortly after her birth and her mother remarried and lives in Ivory Coast along with four boys 4, 11, and 14 who all attend school. Since her mother left to remarry, Atou has been responsible for her own food and shelter. For the last 15 years, 5 days a week, she begged in front of the National Agricultural Bank of Mali. 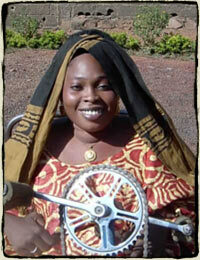 Up until a kind stranger gave her a wheelchair, Atou sat on the ground. It cost her $4 a day for transport to and from Kalabancoura where she rents a room. Typically she would receive from $4 to $18 a day. Though Atou now earns somewhat less during the apprenticeship program, she is happier because she says she is doing something worthwhile. When asked her dream, Atou replied "to earn my own living without having to reach out my hand to beg". She is skilled at Bogolon mud painting on scarves and pillows and hand-tying designs for multi-color dye processes.